It’s here! Diabetes Blog Week has arrived again, and it’s time to let someone else help me figure out what to write about here. Today, we pretend that our health care providers are reading what we write. What would we want them to know (or not know) about our lives with diabetes? Hey there, Awesome Endo and Awesome CDEs! I think y’all are pretty great. You have a really good sense of what people with diabetes are going through, and I believe you really treat this as a calling to help make our lives better and not just a job. I’ve shared links with you in the past, so there’s an outside chance that you are, in fact, actually reading this right now. But you’re all very busy people with lives outside of the office, so I kinda doubt that you actually are. Anyway. What I hope you do see is also what kinda wish you wouldn’t see: People with diabetes are constantly doing things and making choices that are contrary to what we talked about in your office. We present you data that often doesn’t have all of the context. “What happened here?” Well, it’s a long complicated story that started earlier in the day . . . or the day before . . . or all of those years ago when I was on NPH. But really, that’s a lot more detail that I suspect you really want—or that I can remember—so I’m going to make an educated guess. (This probably isn’t surprising to you.) So many of the choices we make are “messy” and nothing like the ones that we talk about in the office. Neither of us is doing anything “wrong”—whether it’s making suggestions based on limited data or living in a way that leads to such choices—but it makes it hard to feel completely honest during the conversations we have where we’re trying to make things better. This is part of the reason why I’m glad that you look the other way at the occasional highs and lows in my logbook. Don’t get me wrong; I’m doing my best to make the right decisions, gather the right data, and do the things we talked about. I’m just really glad that you don’t see the imperfections as failures, because I do enough of that on my own. (Although, I’m getting much better at being okay with those misses. 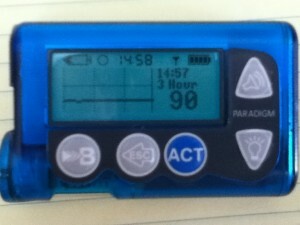 So, thanks for reading and for helping me be the best human pancreas I can be. Oh! 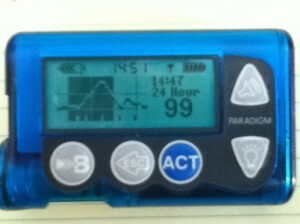 And I wish I could always show you CGM reports like the first picture below; but, really, they’re more often like the second one. If you are a health care provider, be sure to read Céline’s post today. So hard to convey the context, isn’t it?